Millions of people around the world should be monitoring their eye pressure (intraocular pressure) at home, according to health organizations (such as International Society for Self-Tonometry (ISST)) that are issuing recommendations on what to do and how to do it. Many experts, such as Dr. Graham Lee, feel the evidence is quite strong that home eye pressure monitoring leads to better control of intraocular pressure, and the evidence is quite strong that intraocular pressure control lowers the risk of glaucoma progression and optic nerve cell death. Home eye pressure monitoring also gives patients the physiologic feedback they need to see regarding how their daily activities and their stress levels affect eye pressure. According to recent findings, a minority of the people with elevated eye pressure have it fully under control, so new approaches are needed to get better control. Frequent self-tonometry (home eye pressure monitoring) with currently available technology is the best solution, according to glaucoma expert Dr. Robert Ritch. Currently, glaucoma patients need to obtain their doctor's permission to purchase a tonometer for use at home. 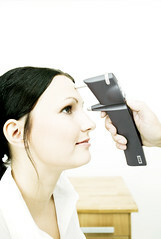 FitEyes.com, an online community for eye pressure research, includes, as members, many glaucoma patients who have purchased tonometers. For patients who have their doctor's permission to purchase a tonometer, FitEyes.com can be an excellent resource. You can contact FitEyes.com via email to learn more. Glaucoma patients in the FitEyes community have a wealth of personal experience, and, as a group, they have interacted with almost all the tonometer manufacturers in the world. Before any glaucoma patient purchases a tonometer, we recommend that you check with the community at FitEyes.com to learn the experiences of other patients. Home eye pressure monitoring opens the door to totally new and innovative ways of managing glaucoma and intraocular pressure. The future will be telemedicine. You will take your own eye pressure at home and transmit it to a computer, and someone, either a physician or another caregiver, will make recommendations for adjustments in your medication, exercise, diet, lifestyle or stress management. The International Society for Self-Tonometry (ISST)) research program will include many of these capabilities, including the ability to take your eye pressure at home and transmit it over the Internet to our research database. From there, ISST hopes to let glaucoma patients can consult with qualified experts regarding exercise, diet, lifestyle or stress management techniques that may help the patient manage their intraocular pressure better. The day will come when out-of-the-office intraocular pressure data becomes the primary data ophthalmologists use to make treatment decisions because it is a far better source of information than what is currently used. For those who want to participate in ISST's self-tonometry program, the future is here, according to medical articles such as Self-tonometry in glaucoma management--past, present and future. 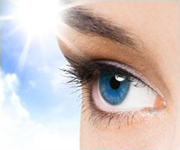 Below are two tonometers featured in this article about home eye pressure monitoring. ISST is currently utilizing the iCare rebound tonometer (left) and the Reichert 7CR non-contact tonometer (right) in their eye pressure research program. They claim to have found these two tonometers to be the best. 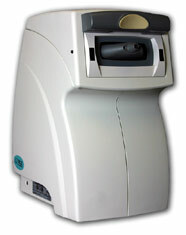 You can find more information on the Reichert 7CR at this link. You can learn more about the iCare at this link.